Welcome back to Wednesdays With Barth! I hope you enjoyed some thought provoking reading this week! Faith is the total positive relationship of man to the God who gives Himself to be known in His Word. It is man’s act of turning to God, of opening up his life to Him and of surrendering to Him. It is the Yes which he pronounces in his heart when confronted by this God, because he knows himself to be bound and fully bound. It is the obligation in which, before God, and in the light of the clarity that God is God and that He is his God, he knows and explains himself as belonging to God. But when we say that, we must at once also say that faith as the positive relationship of man to God comes from God Himself in that it is utterly and entirely grounded in the fact that God encounters man in the Word which demands of him this turning, this Yes, this obligation; becoming an object to him in such a way that in His objectivity He bestows upon him by the Holy Spirit the light of the clarity that He is God and that He is his God, and therefore evoking this turning, this Yes, this obligation on the part of man. It is in this occurrence of faith that there is the knowledge of God; and not only the knowledge of God, but also love towards Him, trust in Him and obedience to Him. But these various determinations of faith are not to be understood as parts or even certain fruits of faith. Each one is the determination of faith in its entirety. If we speak of the knowledge of faith, we do not speak of something which is faith as well as being all sorts of other things, but we speak—even if from a distinct angle—of faith in its entirety. Everything that is to be said of the nature of faith in general will also have to be said of the knowledge of God as the knowledge of faith. And we cannot speak of the knowledge of God except by speaking of the nature of faith in general even if from a distinct angle. Logos Bible Software Version Church dogmatics: The doctrine of God, Part 1 (Vol. 2, p. 12). In Barth’s theology God moves first always and man is subject to his move. The evidence of God’s move toward man or the wake that this revelation leaves behind is faith. To Barth faith must not be divided up to be understood but seen in its totality to be understood. The converting faith of Acts, responding faith of Hebrews, working faith of James, persevering & virtuous faith of 1/2 Peter and Revelation along with Paul’s emphasis on justifying faith seem to be all wrapped into one inseparable whole from Barth’s point of view. I was listening to a Brennan Manning interview a couple of days ago and he said “All is Grace”. It seems from Barth view of faith here we could conclude that Barth is saying “all is Faith”. Can we even experience, know or understand grace without faith? Can grace even be communicated from God to man through any other avenue than faith? I am looking forward to reading more about how Barth sees the work of The Spirit with the occurrence of faith. 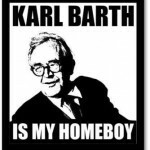 Learn more about Karl Barth here. Buy his Church Dogmatics in LOGOS here. *Reading list generated by Logos Bible Software. To be much for God, we must be much with God.